If you had asked me a few years ago before I was a home owner, I would have said that service plans and warranties are a waste of money. However, I have learned differently. We currently have one of each of these. Service plans: We have a service plan for our heating and cooling units. We use Schneider Classic Aire Care. For $158 a year, they come out twice. They check our heating unit in the fall and our air conditioning in the spring. If we need any parts we get a 15% discount. The cost for two service calls would be the same, but you wouldn’t get the 15% discount on parts. Also, by having this plan, we are sure to make the appointments for these preventative checks. It helps me stay on top of these two things that really affect the comfort level in our home. If you are not in St. Louis, check out your local heating and cooling company to see what they offer. Warranties: We have something similar to a warranty, called a protection agreement (from Sears), on our dairy dishwasher. We bought the appliance from Sears when our older son was born because prior to that we had to do all our dishes by hand. What a time-saver it has been! 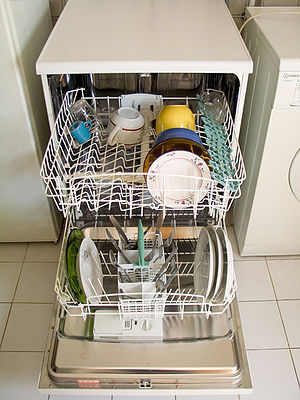 The price varies on the dishwasher you have and how old it is. We pay $98.49 for one year. Without a plan like this, it would cost us anywhere from $50 – $100 for one service call. We have definitely benefited from this plan: getting a new bottom rack for free when prongs were breaking off and getting it checked out to prevent problems. Now we did decide not to get the same plan for our other dishwasher, because the plan would cost close to the cost of a new dishwasher. You make the decision depending on your particular appliance. As for car warranties, that is a whole ‘nother post!